14-year-old Janie lives in a world where war is very common. Her parents are communists, which means they are on a different side to most people. To avoid being put in prison, Janie and her parents have to leave America and move to London. When she arrives, a boy called Benjamin befriends her. However, being friends with Benjamin wasn’t a very smart move. Benjamin’s father is the apothecary, and owns a shop with potions. One day, while Benjamin and Janie were in the apothecary’s shop, the Russian spies turned up, and the apothecary thrusts them a magical book (the Pharmacopeia) and hides them in the cellar. When they go back upstairs, the shop has been ransacked and Benjamin’s father had disappeared. 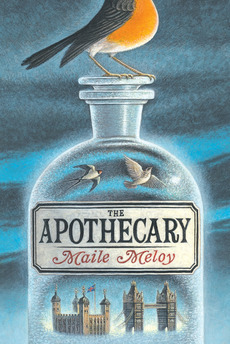 Will Benjamin ever find his father, the apothecary? Can Janie and Benjamin hide from the Russian spies? Is anyone trustworthy? This was a spellbinding novel, with irresistible characters. Although the cover wasn’t very captivating, I was enthralled from the very first paragraph. I would highly recommend this book to children from ages 10–14, with a vast imagination. This novel receives 110% approval from me. Celine is one of our regular book reviewers. Her most recent review (if you don’t count this one) was of The 26-Storey Treehouse. If YOU would like to send us a book review, check out our submission guidelines. Happy reading!